In front of a turnout that has become recogniseable with Guinness ‘Greatest of the Streets’ competitions, defending champions Trafalgar eased to comfortable 2-0 win over host New Amsterdam Kings to retain their title as the curtains came down on this year’s tournament on Saturday night, at the New Amsterdam Ferry Stelling. 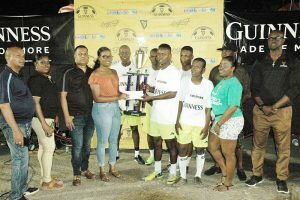 Banks DIH Berbice representative Renesha Gilford hands over the winning trophy and cash prize to Trafalgar Captain Adrian Price in the presence of Guinness Brand Manager Lee Baptiste (right), teammates and other officials last Saturday. Playing in front of a partisan crowd that converged on the venue which resembled a Carnival atmosphere, the visitors never allowed the absence of senior members Kevin Layne and Delroy Fraser, who were on national duty in Suriname, to affect their pursuit of victory. Instead, the prolific Olvis Mitchell took up the responsibility very well and opened the scoring in the final when he raced on to a pass from Delwyn Fraser to slot his effort between the legs of the Kings last stop in the 13th minute to silence the crowd. Both teams missed chances to score just before the half as Trafalgar took a slim 1-0 lead to the break. Coming out in the final period, the champions were in no mood to halt their offensive forays and three minutes into the stanza netted their second which gave them a well deserved cushion. It came from a counter attack that involved Layne and Mitchell who exchanged wonderful passes, before a sprinting Tevin McKenzie swept home from close range much to the disappointment of the host band of supporters. Trafalgar, who had looked a much improved unit since last year, controlled the ball and tempo to perfection and dominated possession in the dying moments with the Kings fans urging them to go forward and attack. But apart from a few attempts by star player Jamal Butts no other player looked menacing and the final whistle came with the scores unchanged and Trafalgar walking away with the top prize of $400,000 along with the winning trophy and a spot secured in the national playoffs. Kings for their effort took home $150,000 and a trophy, but must have left the arena frustrated for not being able to keep the top prize in New Amsterdam; especially with the support they were given. In the third place playoff, Gunners ensured that at least one East Bank Berbice team represented when they defeated Lichfield 1-0 in a penalty shootout to capture $100,000, while the loser took home $75,000. Earlier, in semi-final action, Trafalgar beat Lichfield 1-0 with Mitchell the player on target in the 8th minute, while Kings escaped with a 2-0 penalty shootout win over Gunners after regulation time failed to separate a 0-0 stalemate. In the Plate final, NA Kings (B) won the $50,000 winner-take all prize. Among the officials on hand to witness the final were Guinness Brand Manager Lee Baptiste, Outdoor Evenst Manager Mortimer Stewart and several top brass at the Berbice Outlet. Action in the competition now swings to the East Coast of Demerara next month. Also on board as a sponsor was Colours Boutique of Robb Street.